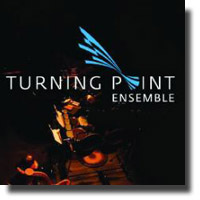 What could possibly connect Canadian composer and virtuoso bassoonist Rudolf Komorous with American jazz pianist and composer Thelonious Monk that would inspire Turning Point Ensemble to develop an entire concert around their work? Komorous is certainly more eclectic. He has written extensively for orchestra, ensembles, electro-acoustic music and even an opera. Monk was an organic musician with a unique improvisational style and considered to be a giant of American music. Turning Point Ensemble (TPE) kicked off with Rudolf Komorous’s atmospheric Strange Sphere. The title obviously derived from Monk’s middle name and a probable genesis for this programme. It was immediately followed by a first public performance of Tony Wilson’s creative arrangement of the Thelonious Monk jazz standard Epistrophy. The original is barely discernible from Wilson’s densely detailed version. Matthew Quayle’s Monk sits down to write a tune is taken from Round Midnight Variations, originally commissioned by Italian pianist Emanuele Arciuli. The piece is intended to be evocative of Monk’s composing process and features an expansive piano solo by Jane Hayes. The first set concluded with Rudolf Komorous’s Twenty-three Poems about Horses. The English text was read by Christopher Butterfield accompanied by strings and woodwind. I would have been interested in hearing Li He’s original Mandarin text to the same arrangement. The second set brought us John Korsrud’s brand new (2013) transposition of Monk’s iconic Round Midnight. The entire ensemble came together for this eight-minute piece that gave us a virtuoso clarinet solo by François Houle and included a stellar vibraphone section played by Vern Griffiths. Perhaps the most accessible piece in the programme was Nietzsche’s Typewriter, a playful little opus composed by David MacIntyre. Curiously, it was NOT dedicated to Friedrich Wilhelm Nietzsche, but to his former teacher Rudolf Komorous. The concert ended, perhaps suitably, with a first public performance of an epic work by composer, teacher and jazz pianist Joseph Makholm. Five in One (Monk’s Moods) is a collection of some of Monk’s popular melodic motifs (presumably five of them). The performance was particularly notable by Vern Griffiths’ subtle expressions on the vibraphone and Jane Hayes robust playing on the Steinway. Even though the programme focused on two innovators famous for their work midway through the last century, four of the selections were recently commissioned by TPE and had their premiere this evening.